The us air force has unveiled a strange looking airship aircraft. 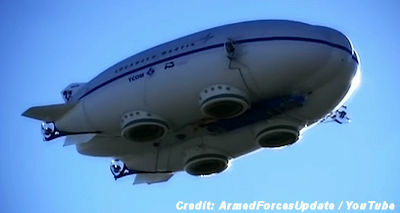 The Lockheed Martin P-791 is an experimental aerostatic/aerodynamic hybrid airship, developed by Lockheed Martin. The first flight of the P-791 took place on 31 January 2006 at the company's flight test facility, located at Palmdale Air Force Plant 42. The P-791 has a tri-hull shape, with disk-shaped cushions on the bottom for landing. As a hybrid airship, part of the weight of the craft and its payload are supported by aerostatic (buoyant) lift and the remainder is supported by aerodynamic lift. The combination of aerodynamic and aerostatic lift is an attempt to benefit from both the high speed of aerodynamic craft and the lifting capacity of aerostatic craft.